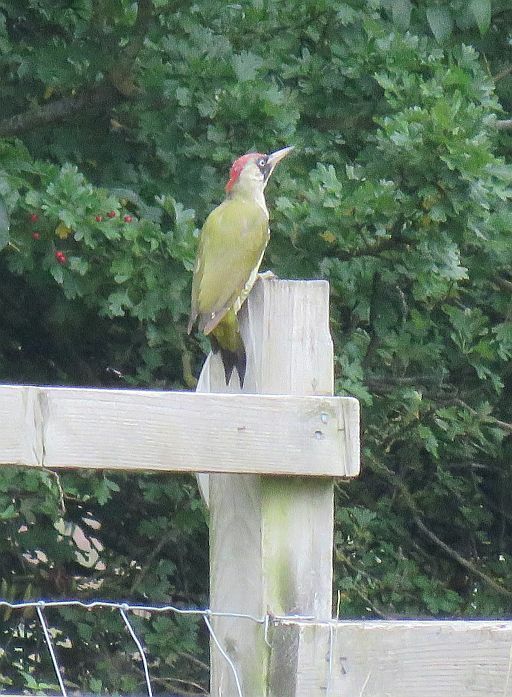 A visit to Area 10 and the car park field at lunchtime, produced of intrest a Kestrel , a juvenille Green Woopecker, Blackcap and Chiffchaff . 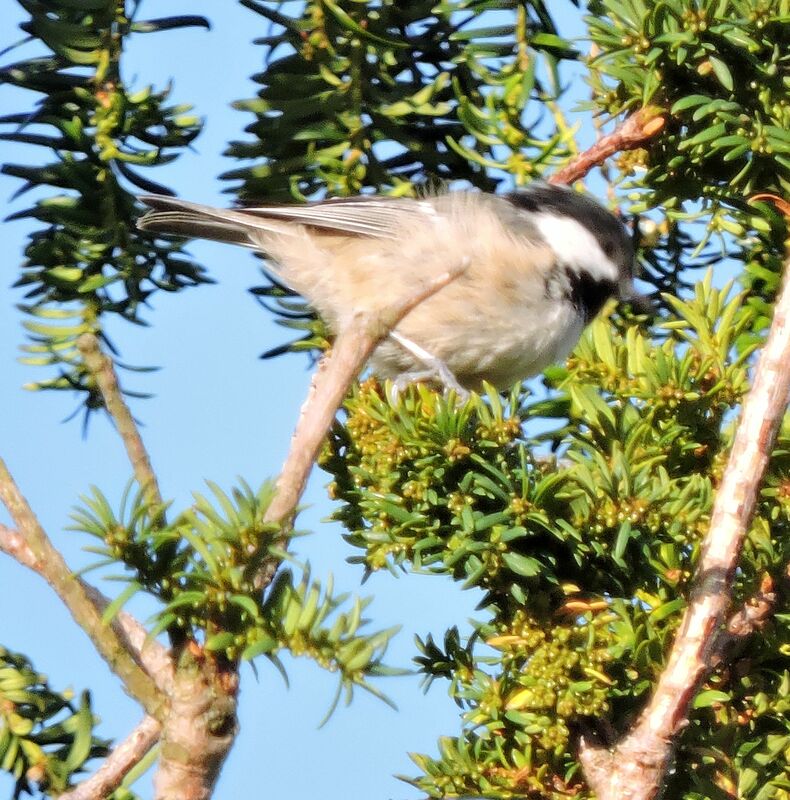 There was no sign of the Garden Warbler Whitethroat Lesser Whitethroat or Redstart seen earlier in the morning by Fraser Cottington. A flock of Lapwing flew over disturbed from the old landfill site. In Area 10 this morning a good number of Blackcap and Chiffchaff were calling from the bushes in the car park field. 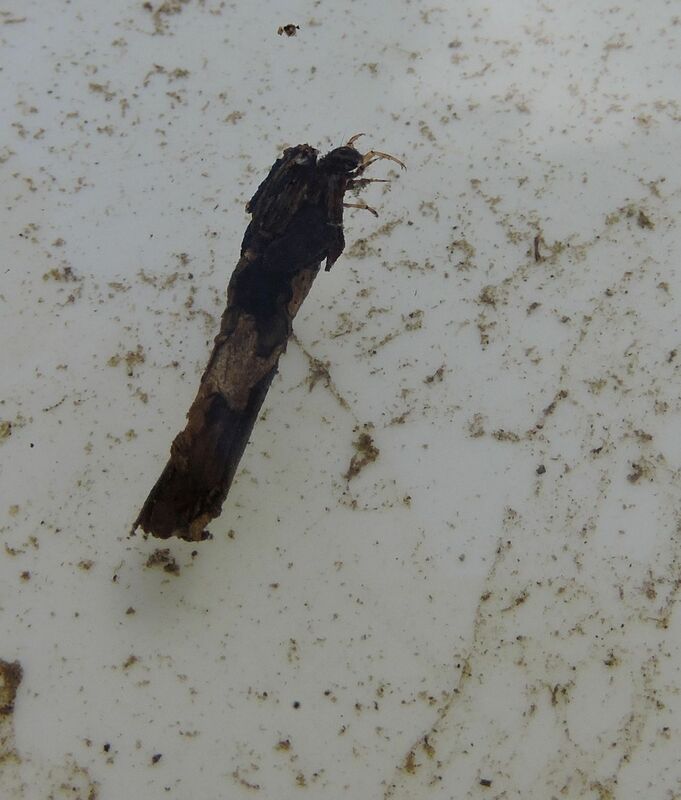 They were also in Area 8 around Toutley Bridge, female Pheasant was flushed from the grass. 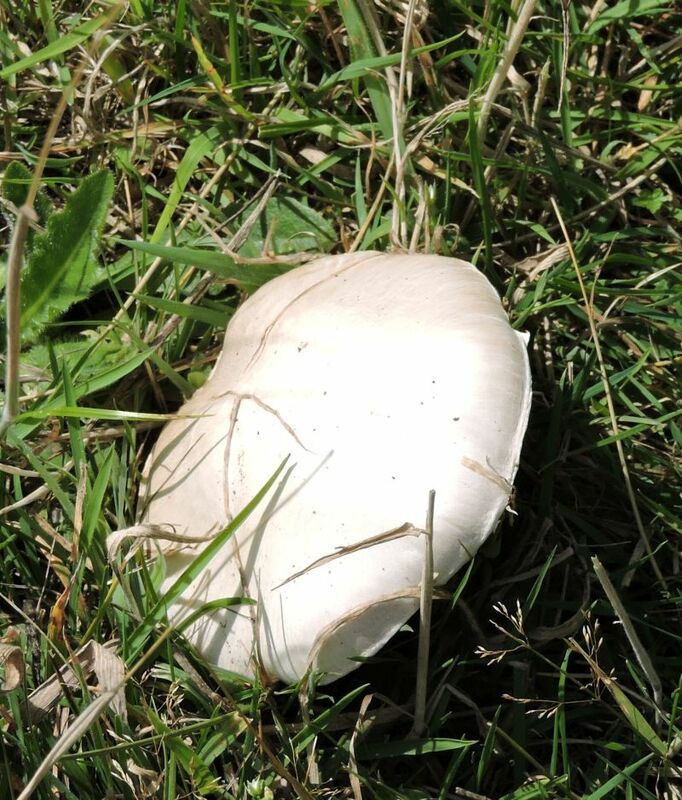 It later appeared in the ploughed field feeding with Roe Deer. 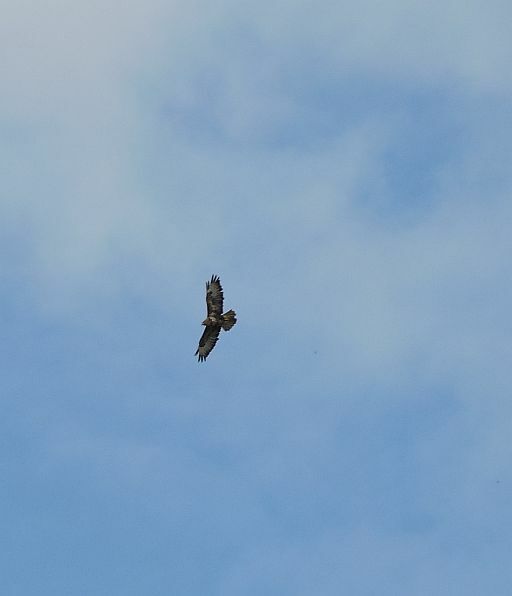 In Area 5, this afternoon a Buzzard was circling on the thermals. Fraser Cottington was out and about in Area 10 this morning.The Spotted Flycatchers were still in the sailing club compound, at least 5. Back to the car park field and there were plenty of Blackcap , Chiffchaff and a Garden Warbler then 2 Redstart , one was either the same 1st winter male as Tuesday's, or a different one, the other bird was a stunning adult male. In Area 10 today Fraser Cottington was out again and reports that a Hobby flew over the car park field low West. 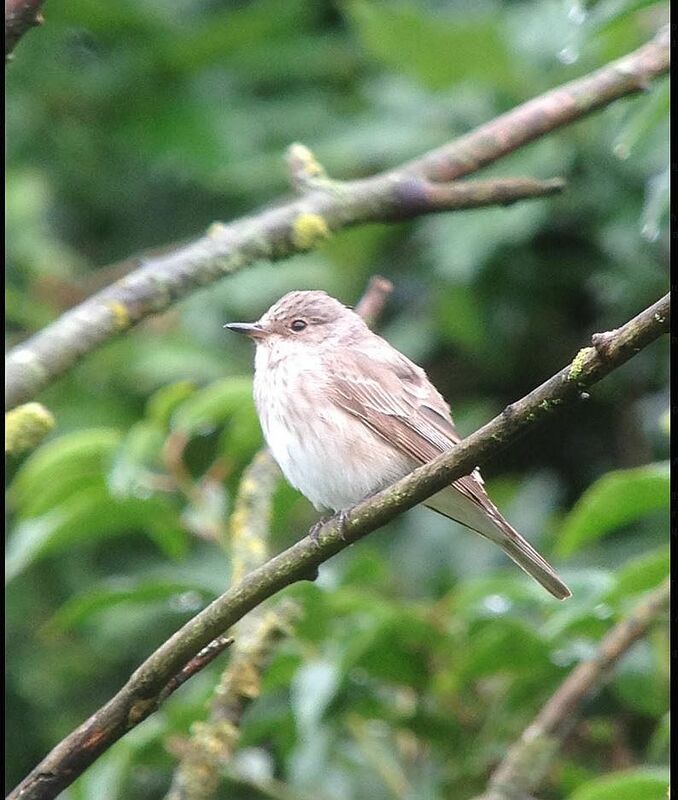 At the compound on the opposite side of Sandford Lane, 3 of the Spotted Flycatchers were on show, the fourth kept back in the undergrowth behind. There was a Willow Warbler in the same tree as them, for a few moments, then it was off. Photo courtesy of Fraser Cottington. 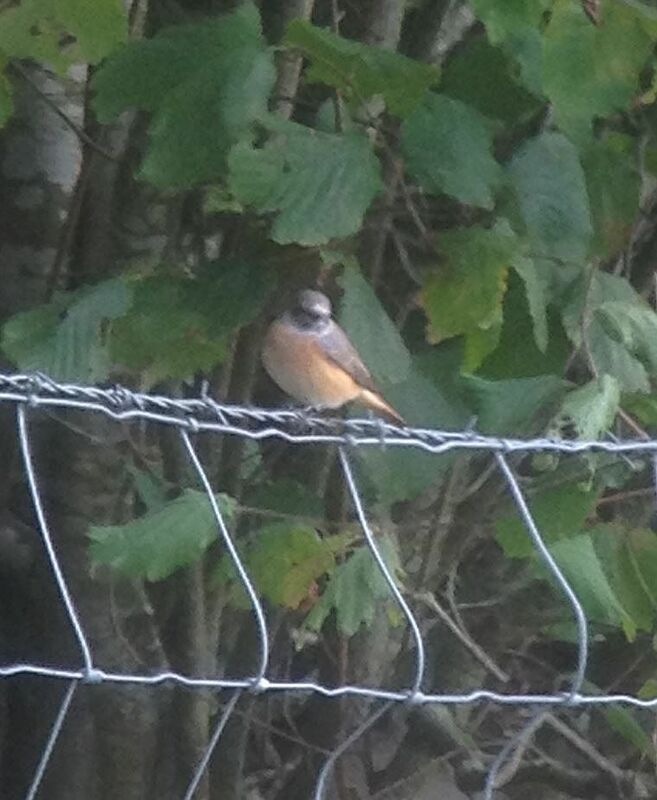 In Area 10 this morning at the car park field off Sandford Lane Fraser Cottington heard, and then saw an autumn adult male Redstart in the usual area along the barbed wire fence . In Area 5, at my garden feeders at least 10 Goldfinch have started to amass first thing in the morning. A least 50% of these are juvenilles. Joining these are Greenfinch in reasonable numbers. In Area 10 Fraser Cottington had 2 juv Bullfinch and 2 Hobby over the car park field. In Area 5, 2 Swift were seen flying overhead and at the Balancing pond in Area 4, 2 Grey Wagtail were seen. Another or maybe one of the two Grey wagtail wasseen by the Area 5 pond. In Area 5 on the way to Morrisons a Grey Heron was seen by Pat Taylor. On Old Forest Road in Area 8 by Toutley Bridge a flock of approximately 20 House Sparrow were moving between the verge and the roadside hedge. In Area 7 a Ring necked Parakeet flew over calling. In Area 5 this morning a Ring necked Parakeet flew over calling. The Kingfisher was heard calling as it flew up and dwnstream. In Area 3 flying over Lidl were atleast 7 House Martin heading S.
In Area 10 at Lavells Lake a juvenille Barn Owl was seen sitting in the entrance of the Owl box. 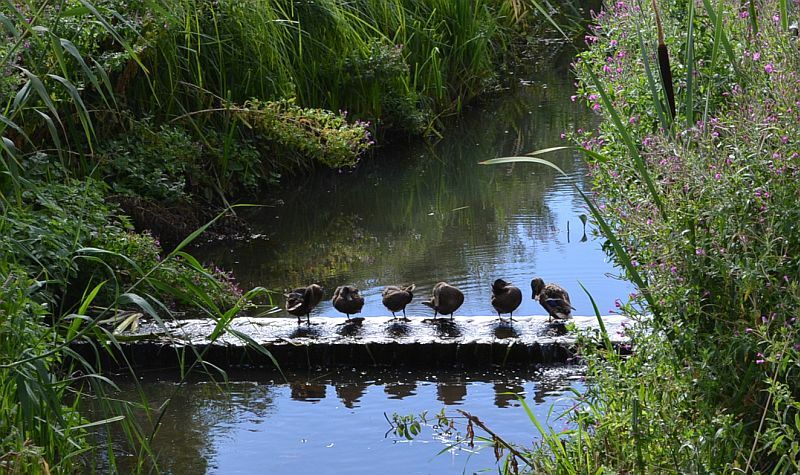 In Area 3 off Ashville Way these Mallard we sitting on the weir befor Balsam pulling started. A Grey Wagtail was also seen. A 2 hour wait for the Barn Owl eventually proved friutfull for Gavin Turner when it emerged from its Area 10 box at 21:15 in the paddock to the rear of Bittern Hide at Lavell's Lake. In Area 5, by the new pond a Grey Wagtail was feeding on the mud. 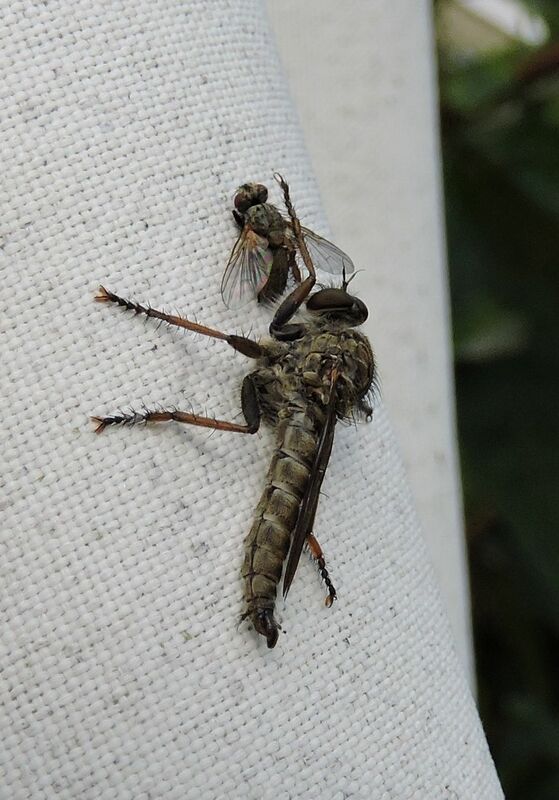 On the garden umbrella at my Area 5 house this afternoon a Kite-tailed Robberfly Machimus atricapillus was busy munching on a fly. 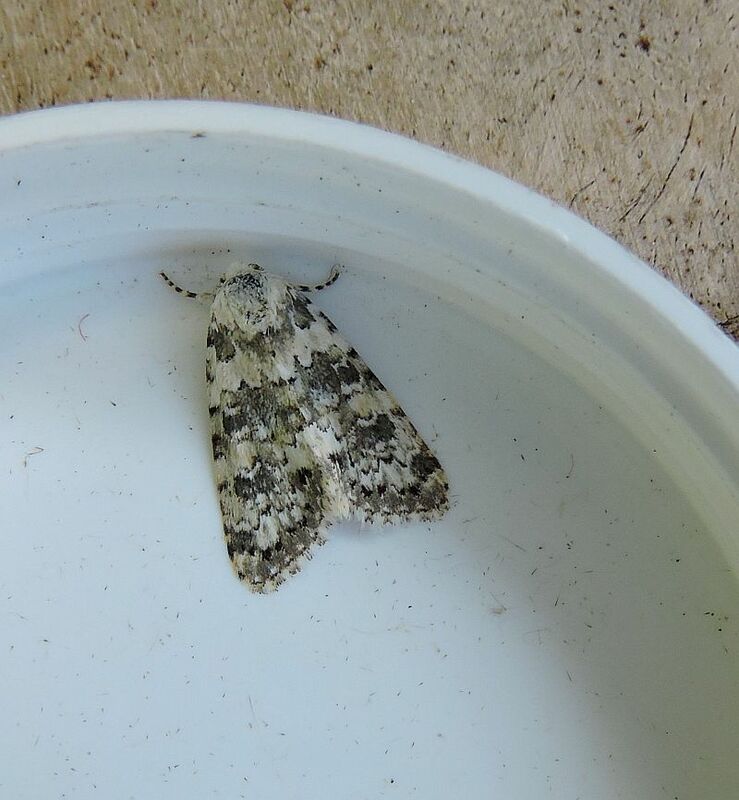 Males of this species are readily distinguished by the projecting tab on the last segment which bears a tuft of black hairs. The tab normally has a forked apex resembling a kite's tail. 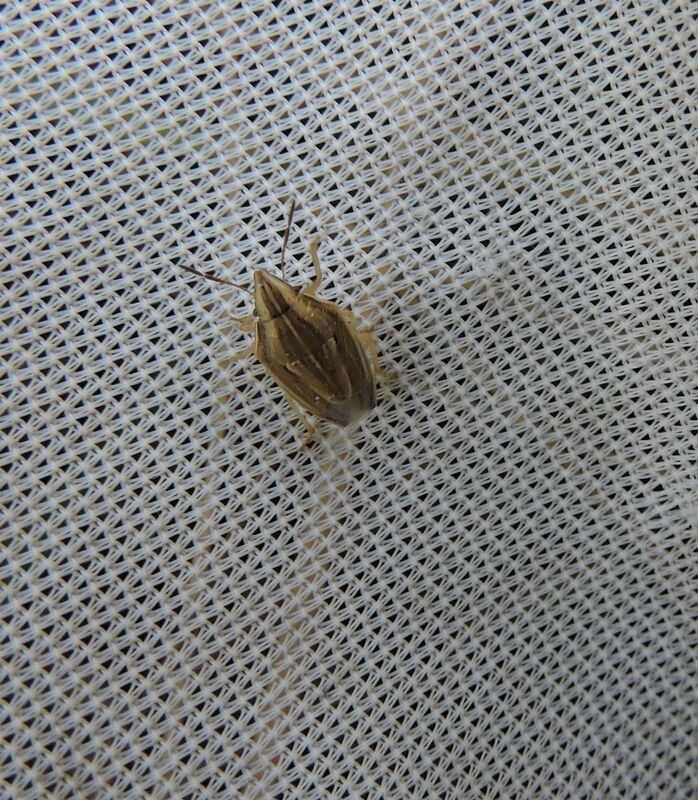 In Area 8 (Old Forest Road) before this mornings Balsam pulling, I popped out with my sweep net in the long grass. 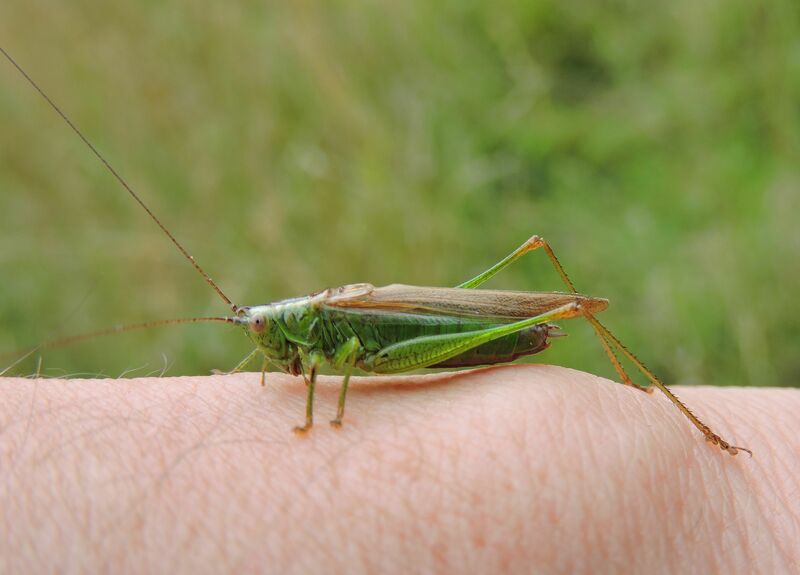 It produced a first for me and the FOTEB Insect list with a Bishops Mitre Shield bug Aelia acuminata and a grasshopper in the shape of a Long winged Conehead Conocephalius cliscolor . 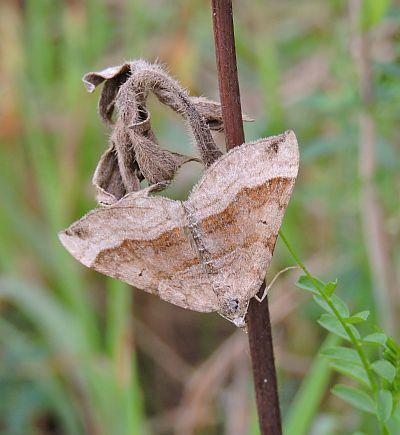 Seen during the Balsam pulling were several moths including Mother of Pearl Pleuroptya ruralis ,Yellow Shell Camptogramma bilineata and Barred hook tip Watsonalla cultraria . In Area 3, by Lidl during the Balsam pulling the first Painted Lady Vanessa cardui icarus butterfly of the year was seen. 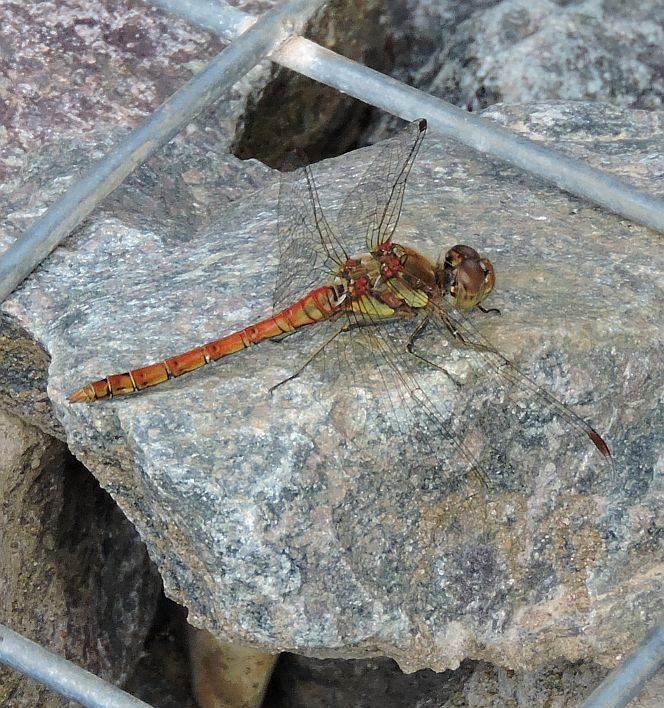 In Area 5 a Common Darter Sympetrum striolatum was seen again at the new pond, sunning itself on the gabions. 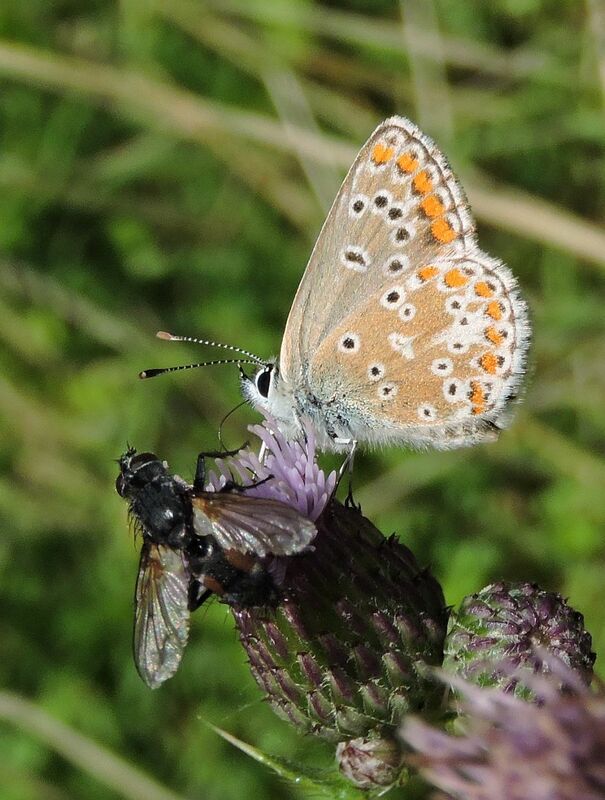 In Area 10 a Common Blue Polyommatus icarus was seen along withMeadow Brown Maniola jurtina, Gatekeeper Pyronia tithonus,Large White Sympetrum striolatum Red Admiral Vanessa atalanta and Essex Skipper Thymelicus lineolae. In Area 5 a Hornet Vespa crabro flew in through an open window, before being swiftly shown the door. 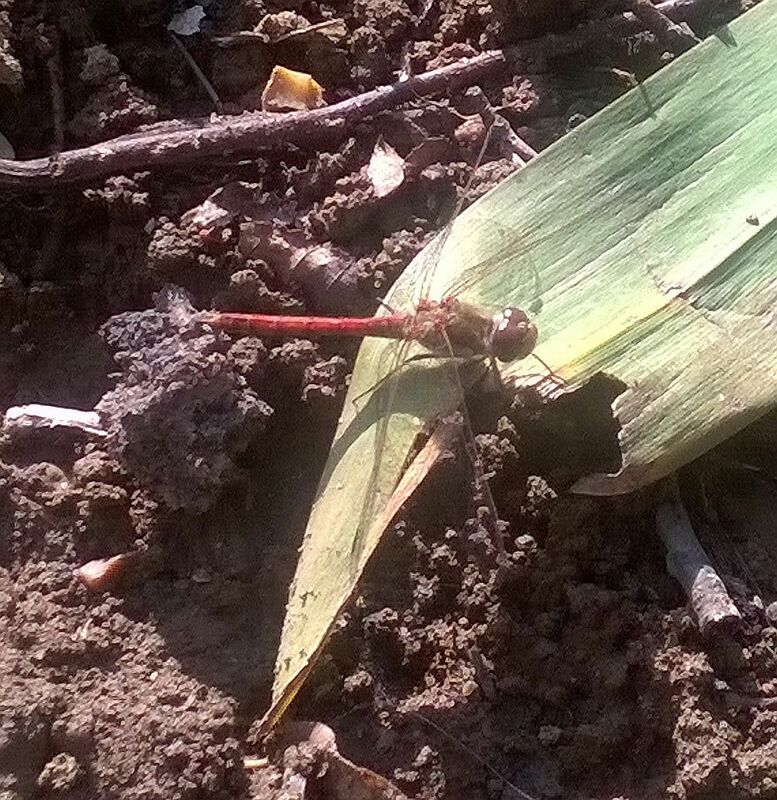 In Area 5 a Common Darter Sympetrum striolatum was seen on the edge of the new pond. 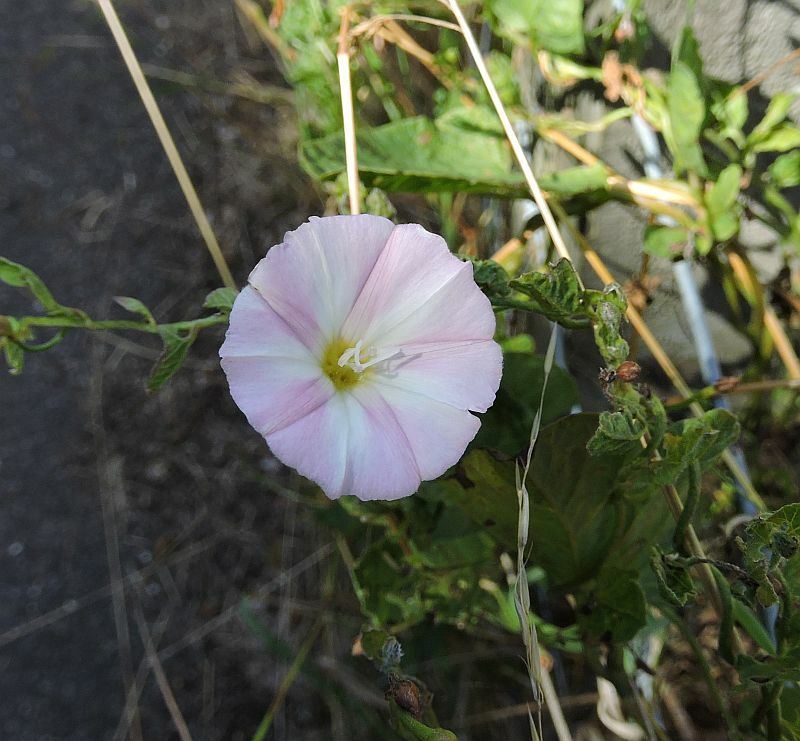 Certainly not a gardeners favourite, but in Area 10 by the footpath from the car park field is Field Bindweed Convolvulus arvensis . Its pink flowers are very distinctive. 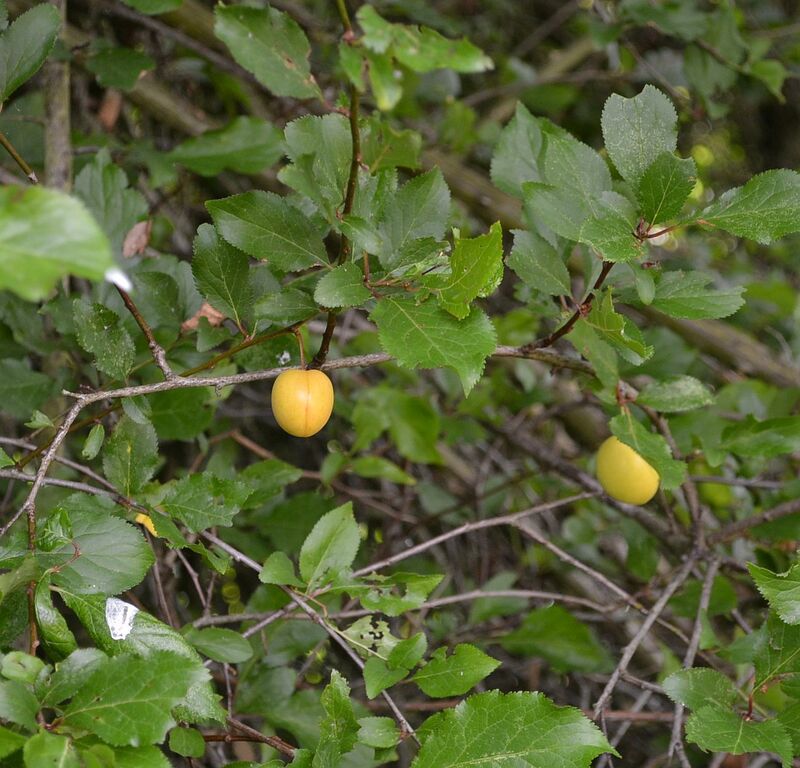 In Area 10 by the footpath from the car park field the fruits of the Crab apple Malus sylvestris are starting to appear. 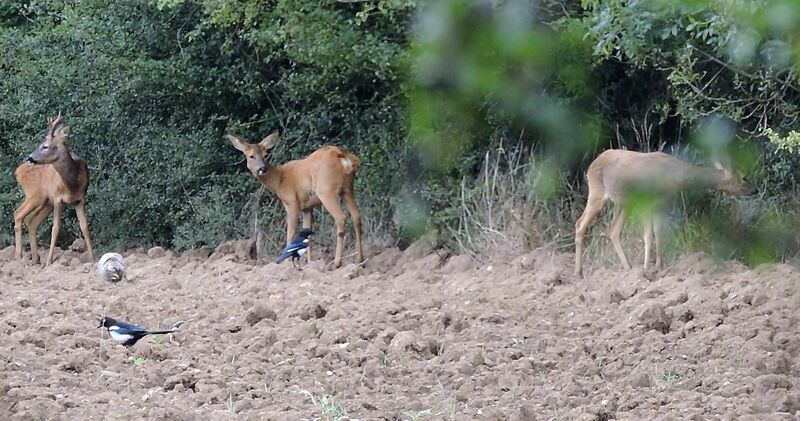 In Area 8 this morning , a male and 2 female Roe Deer Capreolus capreolus were feeding at the edge of the ploughed field off Old Forest Road. Outside my Area 5 house this evening at 20:30 a Pipistrelle Pipistrellus pipistrellus bat was feeding around the hedge in the front garden. 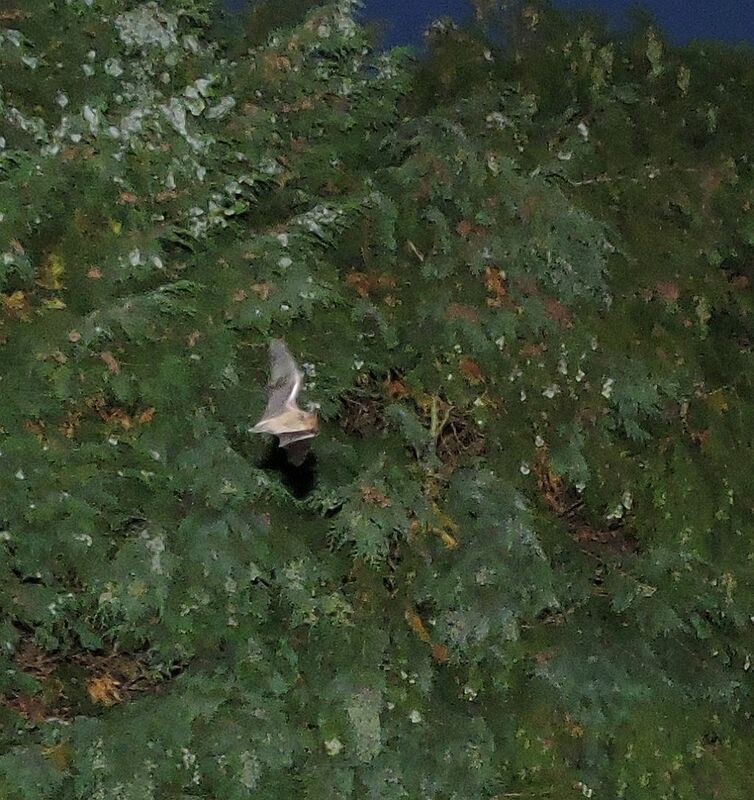 in Area 5 over Brookside at approx 20:30 a solitary Pipistrelle Pipistrellus pipistrellus bat was seen by Holly Swift. 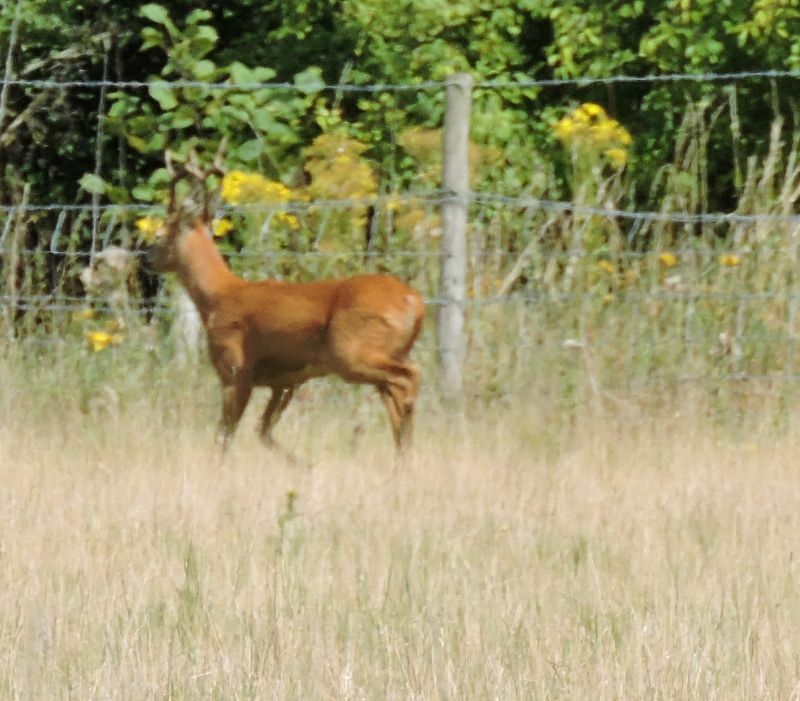 In Area 10 at lunch time, a male Roe Deer Capreolus capreolus was strolling across the car park field on Sandford Lane. 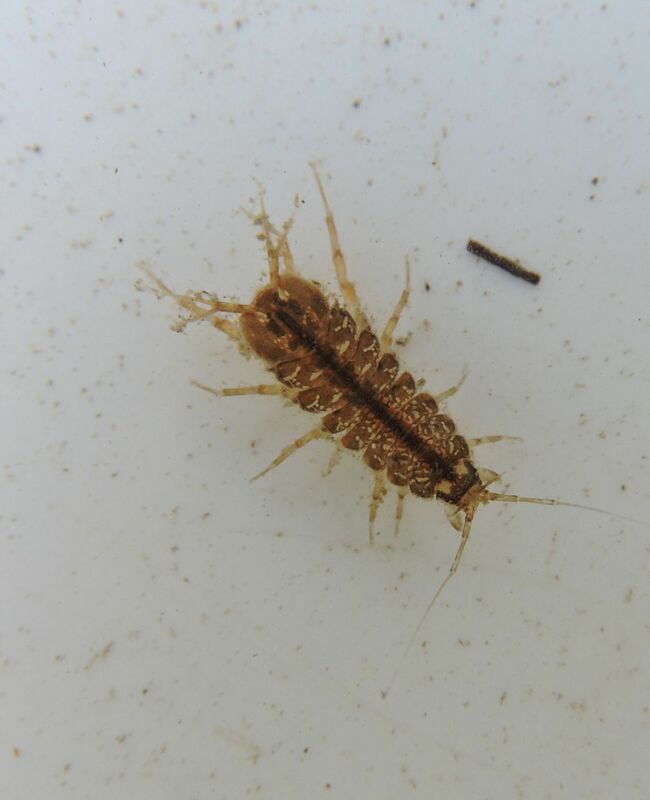 There has not been many reports around the Emm Brook of Hedgehog's Erinceus europaeus visiting gardens. 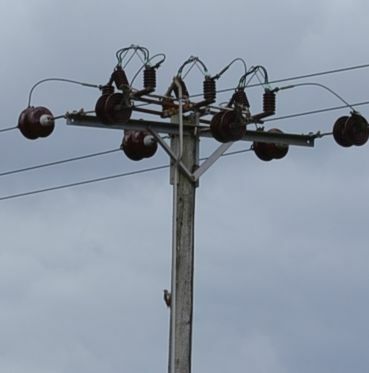 The only ones that I have seen, are unfortunately dead on the roads. At approx 20:00 a solitary Pipistrelle Pipistrellus pipistrellus bat was feeding over the BMX track to the rear of Morrissons. 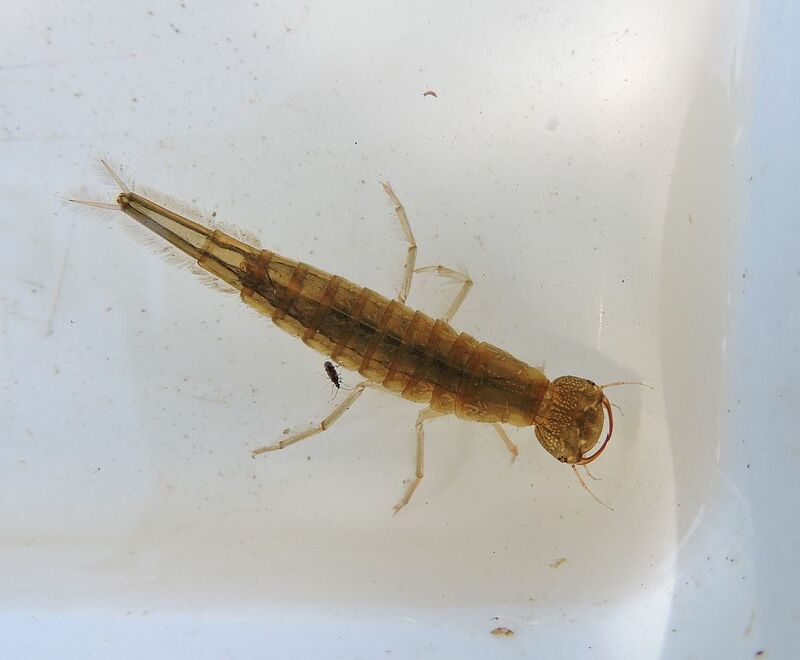 Walking along the Emm Brook in Area 6 to the rear of Clifton Road, Balsam pulling this morning During the kick sampling in the river this morning in Area 5 by Dragonfly Bridge 3 Bullhead Cottus gobio were caught in the net. 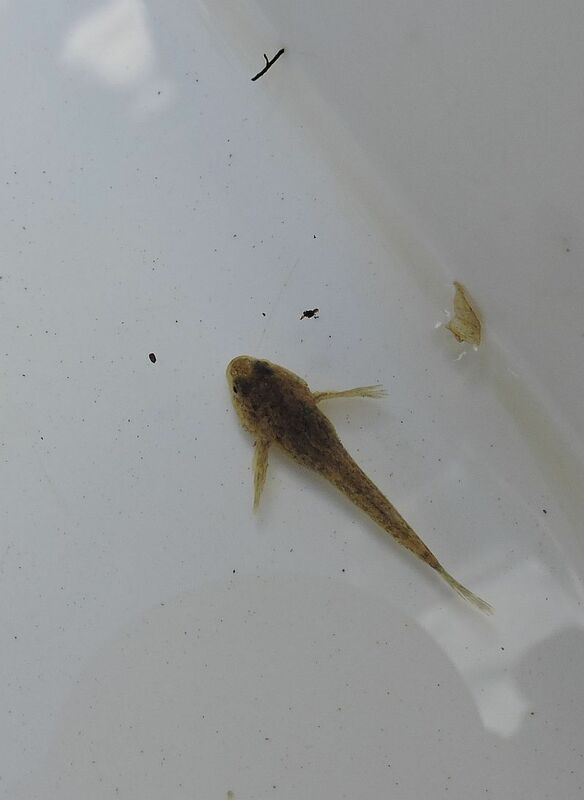 During the kick sampling in the river this morning in Area 5 by Dragonfly Bridge 3 Bullhead Cottus gobio were caught in the net.